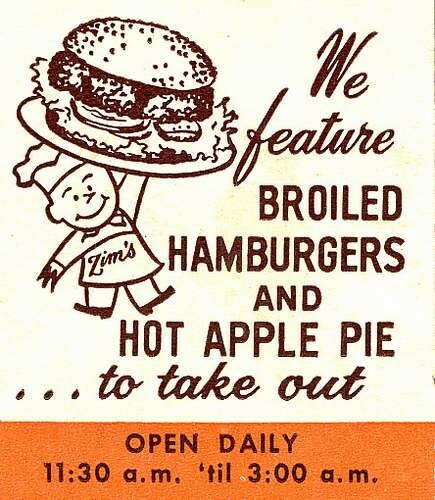 As a young'un, we remember the Zimburgers and milkshakes at Zim's (1949-1995) as being the best salve to the fear of going to our pediatrician up the street. It's a sweeter memory than the derelict quality of the minichain's last standing restaurant on Van Ness in its final, 24-hour years. We are also too young to have been aware of the "coffee-ins" that Local 2 staged to protest unfair labor practices in 1975. We understand now that there are more than rose-tinted memories of a local empire that once numbered 19 Zim's and 16 others, including an all-you-can-eat place called Z's Bountiful Buffets. Our nostalgia remains positive, at least. "Crossing Nazi-occupied Europe with General Patton's Third Army, Arthur Zimmerman wished for two things: to get out of the war in one piece, and to come home to a juicy hamburger and luscious milkshake," J Weekly wrote of Zim's founder, who passed away in 2008. The publication also dubbed Zimmerman the "Bay Area's Unofficial Burger King" and noted his activism within the Jewish community as president of Congregation Beth Sholom, regional president of United Synagogues of America, and president of the Bureau of Jewish Education, Sinai Memorial Chapel and the San Francisco council of the Jewish National Fund. "When Dad came back from the war he borrowed a few thousand dollars and in 1949 opened up a small U shaped 22 seat counter operation at the corner of Lombard and Steiner in SF and called it Zim's," wrote his son, Steve, in a personal remembrance. "The emphasis of his operation was quality and he used whole choice chucks for his hamburgers which were trimmed and double ground and made into hamburger patties daily. Dad used real ice cream for his milkshakes and had a special hot apple pie with cinnamon sauce made for his customers." What do you remember about Zim's?